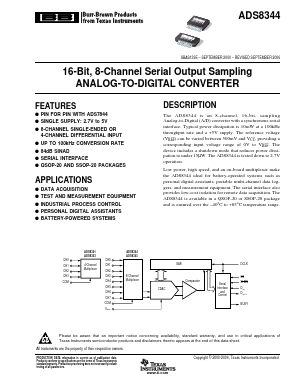 The ADS8344 is an 8-channel, 16-bit, sampling Analog-to-Digital (A/D) converter with a synchronous serial interface. Typical power dissipation is 10mW at a 100kHz throughput rate and a +5V supply. The reference voltage (VREF) can be varied between 500mV and VCC, providing a corresponding input voltage range of 0V to VREF. The device includes a shutdown mode that reduces power dissipation to under 15µW. The ADS8344 is tested down to 2.7V operation.